05-12-2006, 15:09 | Christian K.
Zum 20-jährigen Jubiläum kommt diese Sonderauflage mit Bonus-CD in einer 1-Kilo schweren Steinbox. There is nothing more beautiful or so alluring than self-deceit. In a World full of dead ends there is little to hold onto. One sees oneself in how one stands in relation to others. That can be a lonely picture. Lies, therefore, dominate. Sedge grows in the fen flourishing in the water burning the blood of everyone who touches it. There is no cure. When all seems lost, something unexpected happens. To taint beyond redemption, The World That Summer. 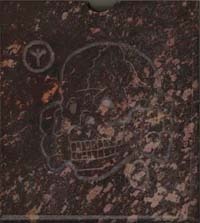 NERUS, in association with Soleilmoon Recordings, announces the release of the 20th anniversary commemorative edition of Death In June’s “The World That Summer”, as a two CD box set. The complete original album is presented on one CD, and is supplemented with an extra CD containing six bonus tracks. The CDs are packed in a custom made stone case carved with Death In June’s signature Totenkopf 6 and Life Rune. The edition is limited to 1000 copies. Customers outside of USA and Canada please remember that we charge the exact cost of postage, and this item is quite heavy: Postage to Mexico will be $11.15, to Western Europe $15.30, to Australia/New Zealand $17.15, to eastern Europe, Asia and Central and South America $18.30. Insurance is extra!